The New York Times and the Washington Post would argue Dan Brown’s purpose is to make another movie featuring the fictional protagonist Robert Langdon (played by Tom Hanks.) ‘Inferno’ is not a work of non-fiction, its purely fictional. Most readers and reviewers end up being disappointed because, they relate the places and organizations featured in the book with their real-life counterparts. These dopplegangers carry out and perform tasks their real life counterparts would never succumb to when push comes to shove. 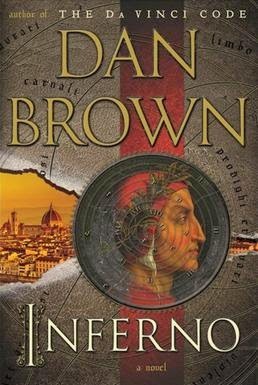 The book begins with Robert Langdon awakening in a hospital with a hazy memory with a recurring nightmare in Florence. He feels a sharp pain in the back of his head when he realizes its a head wound from a possible gun shot. Fearing for his life, his first instinct is to depart the room as soon as he can. His only ally is Sienna Brooks, a child prodigy with one of the highest IQs ever recorded. Together they set off on a journey to retrace all his pre-amnesia steps with the help of Dante’s ‘Divine Comedy,’ which can help them foil the plot of the antagonist. They are unsure about who the real antagonist is; the WHO (World Health Organization,) The Consortium (a Mercenary army,) or Bertrand Zobrist! Dan Brown weaves a tale of betrayal, self discovery and action. There are some improbable super human moments where a college professor like Robert would be way out of his depth. The real twist to this tale however, is that they fail. The fear of failure is one of mankind’s greatest fears. The WHO, Robert, The Consortium and Sienna, all fail. And while the end of the book theaters on the sense of hopelessness, an alternate cure appears which can once again save humanity. In conclusion, this book is a great read if you want to escape reality and would definitely make a great movie adaptation. Dan Brown provides some wonderful imagery and chain of events. It would keep you at the edge of your seat even at its most boring moments. If you are looking for an adrenaline fueled tale which corresponds to art and culture of the yesteryears, look no further than ‘Inferno’. The writer is a final year undergraduate student from the School of Media & Communication, specializing in Print and Online Journalism.